Located on Scenic 30A just east of Grayton Beach. Grayton Beach State Recreation Area’s name comes from the neighboring township of Grayton Beach, one of the oldest townships along the Gulf of Mexico in Walton County. Obtained through a land lease from the Florida Board of Education in 1964, Grayton Beach was dedicated and opened in 1968. Salt spray and wind pruning, two of nature’s landscaping tools, are seen everywhere. What sometimes appears to be “bushes” in the dunes are often full-size slash pines and southern magnolia trees with only their tops protruding from the drifting sand. Also found within the park boundaries are pine flatwoods and scrub. Scenic Western Lake is ringed by extensive salt marsh. Hailed as the “Best Beach in the U.S.” in 1994 by Dr. Stephen Leatherman (see story), this crown jewel of SoWal lives up to its reputation. The park features 1,133 acres of pristine coastal vegetation, a stunning stretch of beach and beautiful Western Lake. An extensive, self-guided nature trail system gives visitors an up-close look at the vast amount of ecological diversity found in the area including sand dunes, the coastal dune lake, pine flatwoods, marsh area and the beach. Facilities available include a pavilion, public restrooms, camping area, picnic areas and a boat ramp to Western Lake. Canoe rentals for lake tours are available. Shorebirds are numerous on the beach, and sea turtles often nest here during the summer months. Foot traffic is prohibited on sand dunes and in nesting areas. Thirty-seven campsites in pine scrub near Western Lake are equipped with picnic tables, grills, water and electricity. Park Rangers provide campfire programs seasonally. There are currently ten cabin units nestled in the woods with twenty more to follow. Cabin patrons enter through automatic security gates and meander down the newly paved roads to the cabin area. Each 800 square foot cabin is furnished with two bedrooms, a bathroom, and a full kitchen including microwave over, dishwasher, stove and refrigerator with an automatic icemaker. In addition, each cabin has a ceramic tile living room area and a sit-down counter with a beautiful gas fireplace. For outdoor relaxation, each unit has a screened in back-porch equipped with a picnic table and grill. Recreation opportunities abound in the area. It is only a short walk down to the restricted beach use area that is equipped with a beautiful new handicapped accessible boardwalk. Cabin Porch Paved bicycle paths connect the cabin area with local restaurants and shops. For the more adventurous there are nature trails as well as canoeing available at Grayton Beach State Recreation Area. Beach wheelchair is available. A boat ramp is available on Western Lake. Saltwater species are caught in the surf, while both fresh and saltwater fish are caught in the lake’s brackish water. 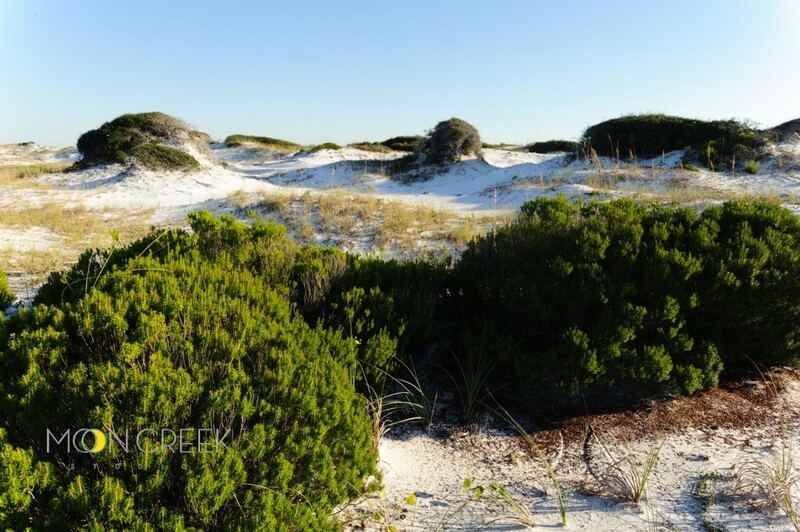 The Grayton Beach Nature Trail begins near the beach parking area and winds among sand dunes, pine flatwoods and scrub communities. It is interpreted by a self-guiding leaflet available at the ranger station. A large picnic pavilion overlooking the Gulf waters is available. Swimming along the park’s one mile of shoreline is very popular for visitors. Located just east Of Rosemary Beach on Highway 98 at Inlet Beach. Camp Helen State Park is a unique geologic landform surrounded on three sides by the Gulf of Mexico, Lake Powell, and Phillips Inlet. Offers a an environment rich in natural resources with natural communities ranging from the dynamic beach and dune communities along the Gulf, through maritime hammock and freshwater wetlands, to sand pine scrub community along the lake. Located on Scenic 30A just east of Seagrove Beach. Deer Lake State Park consists of 1/2 mile of beach front located on the Gulf of Mexico, and a freshwater coastal dune lake nestled among high dunes of which the park was named. Made up of a diverse coastal habitat of southern magnolias, golden asters, woody goldenrod, and scrub oaks. The park has 1500 acres of pine uplands, which are home to many unique plants such as myrtle leaves, holley, Curtiss, sand grass, and pitcher plants. Located in Point Washington off Highway 395 north of Highway 98. Moss-draped live oaks, which predate the Wesley Company, dominate the lawns. Camellias and azaleas offer colorful accents to the scene from October through May; enjoy the peak bloom around mid- March. The site was the hub of the Wesley Lumber Company, one of the many businesses involved in timbering the forests of the Florida Gulf coast from the 1890s until after World War I. Company holdings included a saw mill, planer mill and dry kiln. A dock extended into Tucker Bayou to facilitate the loading of lumber onto barges for shipment. The lumber was barged west to Pensacola, then shipped to northern and western states, Europe and parts of South America. The men who worked for the Wesleys lived with their families in about 20 company-owned houses. A company commissary served their needs. Wesley build his own residence near the mill in 1897, and members of the family lived there until 1953. Fire was not unusual in these sawmill villages where every building was made of wood, and the mill burned three times. After the third fire, it was not rebuilt. All that remains today on the 12 acres in Walton County are the Wesley house and a few scattered building foundations. Even though the little community declined and its population scattered, the Wesley family stayed. This was their home, a place where their births, deaths and marriages occurred. In 1953, when the last of the Wesley generations died, the house and land were sold. Ten years later, it was on the market again; and Lois Maxon fell in love with it and purchased it. The house was probably the largest residential structure in the area. The house’s timber framing was cut nearby and floated down the Choctawhatchee river. The design was one that became familiar throughout the Florida panhandle during the 19th century: two stories, each made up of two equal groups of two rooms, divided by a central hallway on both stories. Its style of construction was well-adapted to Gulf coast conditions in the days before air conditioning. The house was built on piers, permitting air circulation while avoiding extreme flood damage when Tucker Bayou or Choctawhatchee Bay rose. Porches circled both stories. Windows on both floors were very large permitting free air circulation during the hot, humid months. Lois Maxon developed the Wesley house as a showplace for her collection of family heirlooms and antiques. Changes were made to suit her needs. Two original chimneys and partition on the first story were removed to make the large music room. A fireplace and chimney were added on the south porch. Extra rooms were created at the rear of the house by enclosing the porches of both stories. The brick infill around the foundation that makes the house appear to have a solid basement probably dates from her time as well. The grounds were developed by Miss Maxon to show the house to full advantage. In 1968, Miss Maxon donated Eden to the state of Florida in memory of her parents. Guided mansion tours are offered Thursday through Monday on the hour from 9 a.m. to 4 p.m. ($1.50 adults, $.50 children). Admission to the park is $2.00 per carload. Picnic facilities, overlooking Tucker Bayou, are available. Eden State Gardens is located one mile north of Highway 98 on County Road 395. Info subject to change, call 850-231-4214. The grounds, gardens and picnic area are open daily from 8 a.m. until sundown. The house is open for hourly guided tours from 9 a.m. – 4 p.m. Thursday through Monday. A nominal fee is charged for tours. A picnic area with adjacent parking is available at the old mill site on Tucker Bayou. Highway 395, running north from Seagrove Beach to Eden State Gardens in Point Washington is near the center of the 15,000 acre State Forest. Hiking and biking trails crisscross the area, once prime habitat for Black Bear and Wild Boar. The trails are part of the state’s plan to construct a greenway trail system that will cross the forest connecting Grayton Beach State Park, Deer Lake State Park, Topsail Hill State Preserve, Butler Elementary School and residential developments. Overall, the trail system includes more than 27 miles of hiking and biking trails to the public. The state purchased the forest in 1992 under Florida’s Conservation and Recreation Land Program. The Division of Forestry takes care of the forest through controlled burns and wildlife management. The longleaf pine is the predominant plant life in the forest, and the majority of the area consists of sandhill, flatwoods, basin swamps and cypress swamps. Wildlife that calls the forest home includes gopher tortoise, numerous species of birds, alligators, deer quail and turkey. Located on Scenic 30A just West of Dune Allen Beach and East of Sandestin. Topsail Hill State Preserve is named after Topsail Hill, a high, picturesque dune standing 25 feet above sea level. Acquisition began in 1992 under the preservation 2000 program. In 1998 , the Gregory E. Moore RV Resort was purchased. Today the park encompasses 1,640 acres. The park has 14 natural wild plant communities from beach dunes to pine flatwoods. Coastal dune lakes, wet prairies, and maritime hammocks are rare and unique communities found in this park. Full RV camping is provided in 156 campsites with full hookup. Concrete pads, concrete patios, with picnic tables. Cable television and telephone hookups available. Pets allowed with restrictions. Activities include winter programming in the resort clubhouse. Shuttle to the beach. Interpretive programs on natural and cultural resources by request. Shuffleboard, tennis, horseshoes, and heated swimming pool. Laundromat on site. The Beach Dune community provides habitat for the endangered Choctawhatchee Beach Mouse. The preserve is one of only two remaining natural populations. Sea turtles come ashore late spring and summer to nest. Rookeries of herons and egrets are found within the cypress swamps. White tailed deer, fox, coyote, raccoon, and gopher tortoises are common. High, picturesque dunes provide the perfect backdrop to the nearly three and a half miles of pristine white quartz-sand beach along the emerald waters of the Gulf of Mexico. Surf fishing, swimming, sunning and wildlife observation are popular. Bicycling and roller blading are possible on our 2 miles of paved roads within the RV Resort. There are 12 bungalows in a small neighborhood setting with beautifully landscaped lawns and natural setting of the preserve out the backdoor. Each bungalow has a carport, full kitchen, bathroom, bedroom, and living room. All are completely furnished. Other amenities may include screened-in porches, a den, and utility room. The swimming pool, laundry facility, clubhouse, and country store are easily accessible. Rentals are from one month to six months. Freshwater fishing in 6 lakes. License required. Saltwater fishing available in the Gulf of Mexico. The park has maritime nature trails located south of Morris Lake which traverses ancient dunes and scrub communities. The trail is 2.5 miles in length. Picnic pavilions are located at the south end of Topsail Road. The emerald green waters of the Gulf of Mexico provide visitors the opportunity to swim in a saltwater environment. No lifeguard protection is provided. Shopping is nearby at the park country store with basic food items and merchandise. Limited RV supplies and propane. Exhibits are located throughout the park and RV resort. The RV resort has two temperature-controlled bathhouses. For a detailed description of South Walton Beach Accesses with maps and videos, visit the SoWal.com Beach Access Guide.